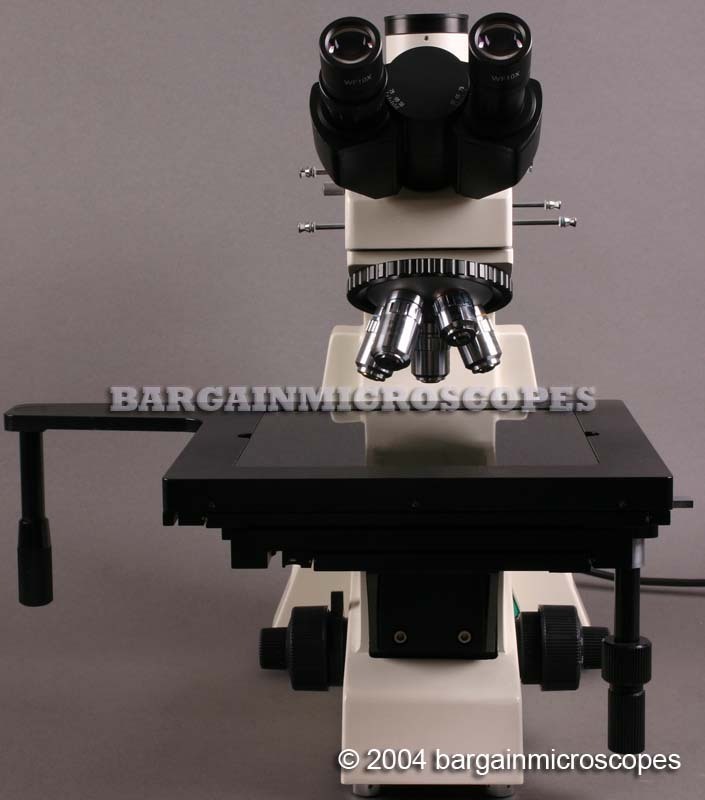 Excellent Quality Upright Trinocular Professional Metallurgical – Metallographic Microscope! 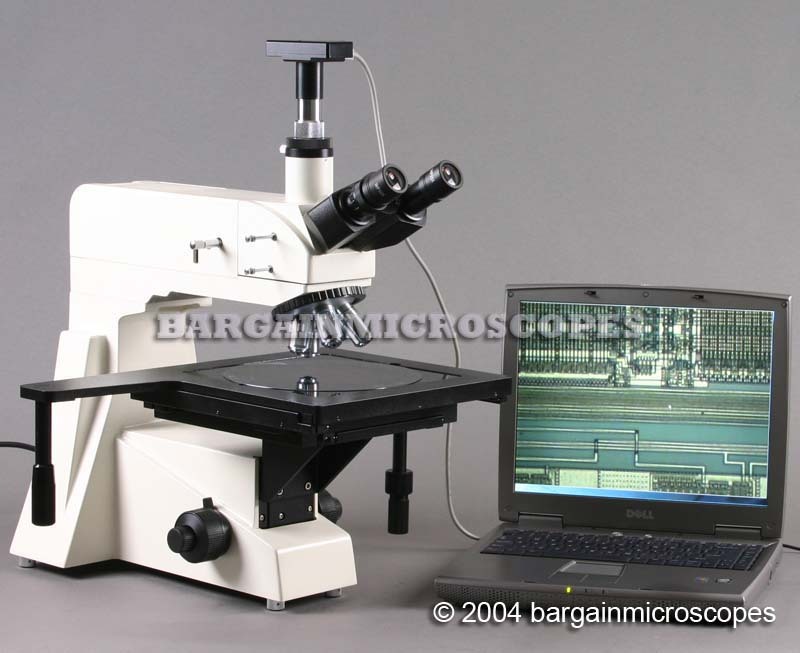 Super Sized Microscope! 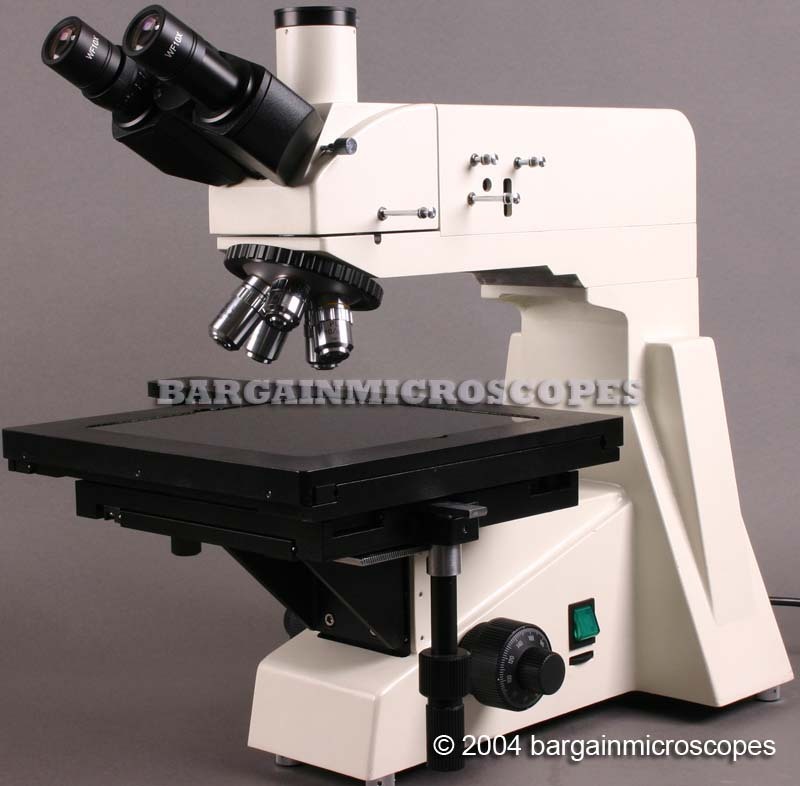 This is a Huge Microscope and Heavy Duty! Extra Large Stage with an Incredible Maximum Stage Travel of 11 Inches (X-Direction) x 9 Inches (Y-Direction). 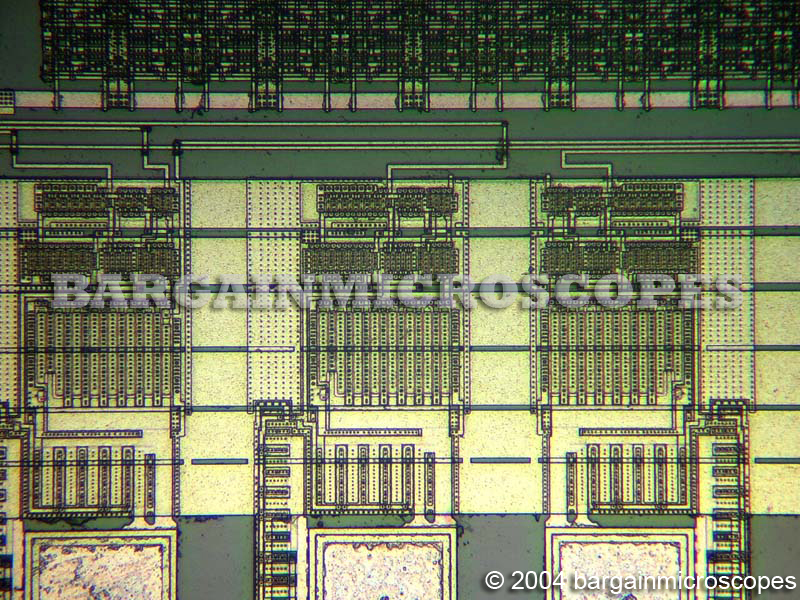 The Large Travel is Suitable for Examining Large Silicon Wafers and Other Sizable Specimens as Most Scopes would Require the Specimen to be Relocated in Order to View it Completely. Stationary Head – Movable Stage. Different Applications Require Different Arrangements. This Scope has its Stage Move Up/Down to Focus. We Carry a Similar Scope that Instead has its Head move Up/Down to Focus. Great for Detailed Inspection of a Metallic Surface. 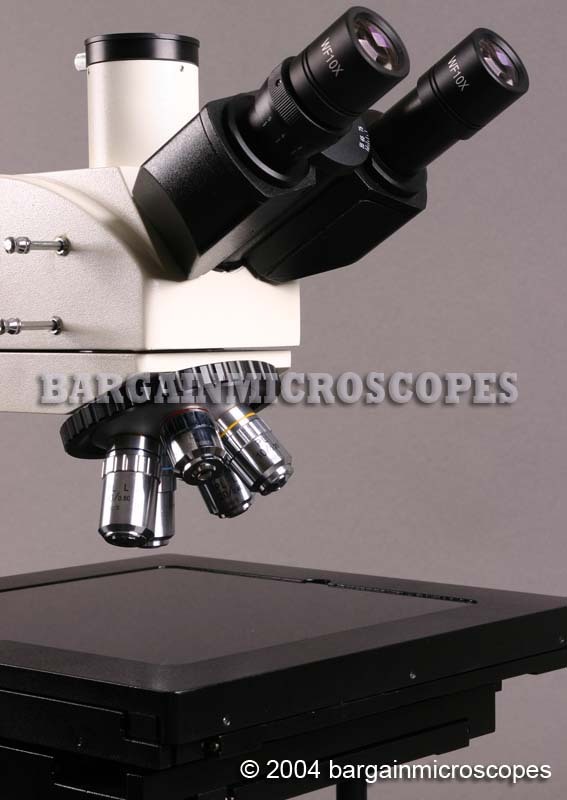 Perfect for Metallurgical Laboratories, Foundries, Silicon Wafer Inspection, Industrial Applications, and Quality Control Labs! 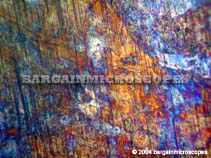 Excellent Bright and Clear, High Contrast Images through High Quality Optics. Great for Viewing Opaque Surfaces – Light Travels Through the Objective and Reflects off Surface of Object and Back Into Objective! No Worries about how to get Light to the Specimen’s Surface! 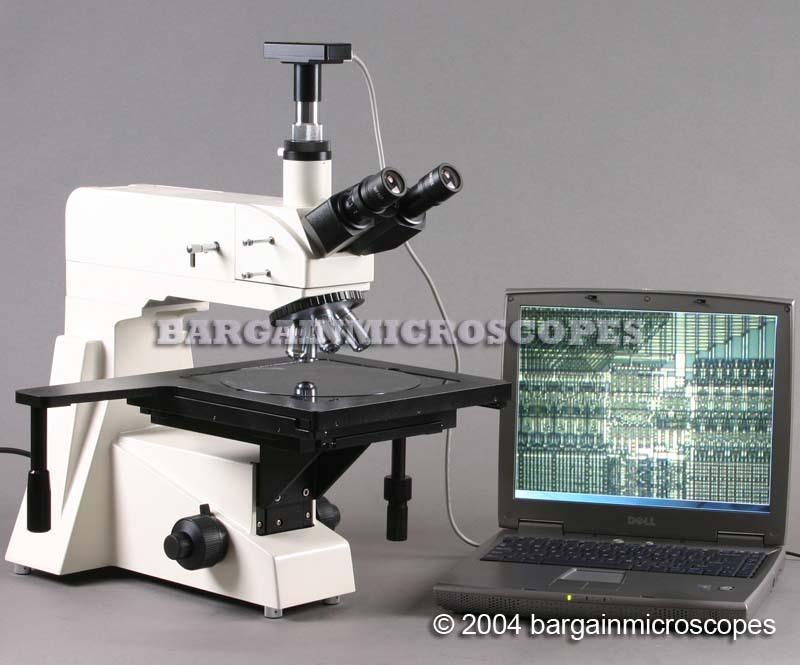 Epi-Illumination Microscopy System: Light From Internal Source goes through the Horizontal Top, Reflects Down through Objective to the Specimen, Reflects off the Specimen, and Back into the Objective and then to the Eyepieces. Also known as Reflected Light Microscopy. 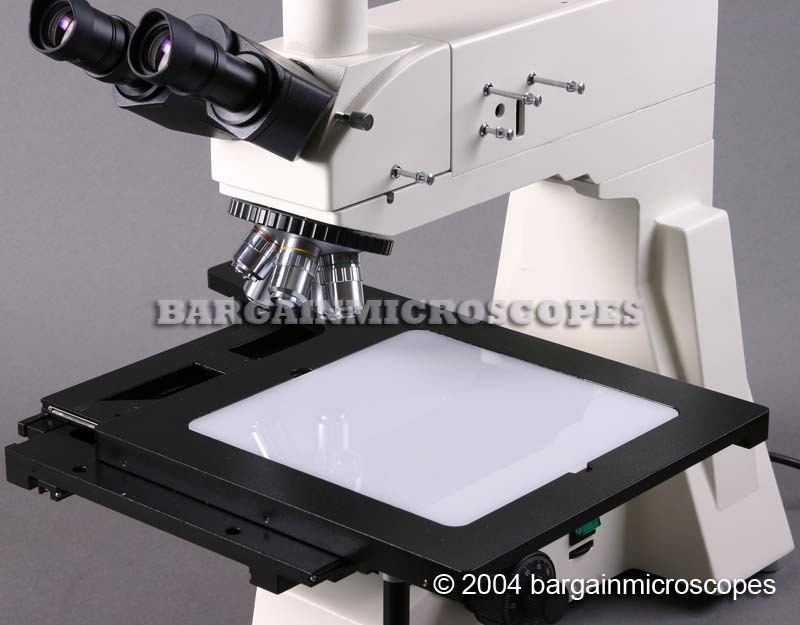 Includes Polarizer and Analyzer! 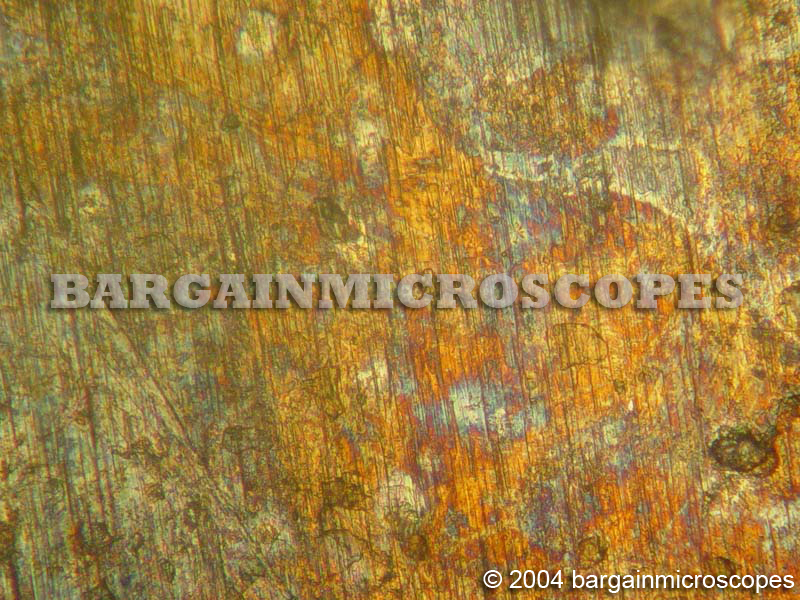 View your Metallic Specimens under Cross Polarization Conditions using Epi-Illumination! Great Economical Price! Priced Thousands Lower than Competition! 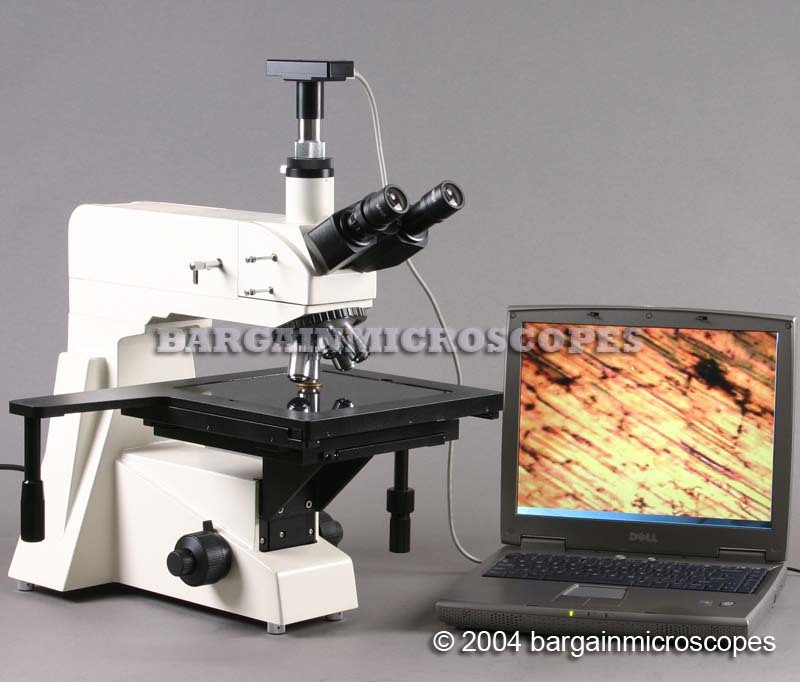 Images from this microscope system. Captured with the included jpg camera. Five Magnifications: 50x, 100x, 200x, 400x, and 800x. Long Working Distance Objectives! Great for Special Applications where a little More Room is Needed Between Objective and Specimen! Five PLAN DIN Objectives: 5x (18.3mm W.D. ), 10x (8.9mm L.W.D. ), 20x (8.7mm L.W.D. ), 40x (3.7mm L.W.D. ), 80x (0.96mm L.W.D.). These PLAN Objectives are Superior Quality and the Most Expensive. 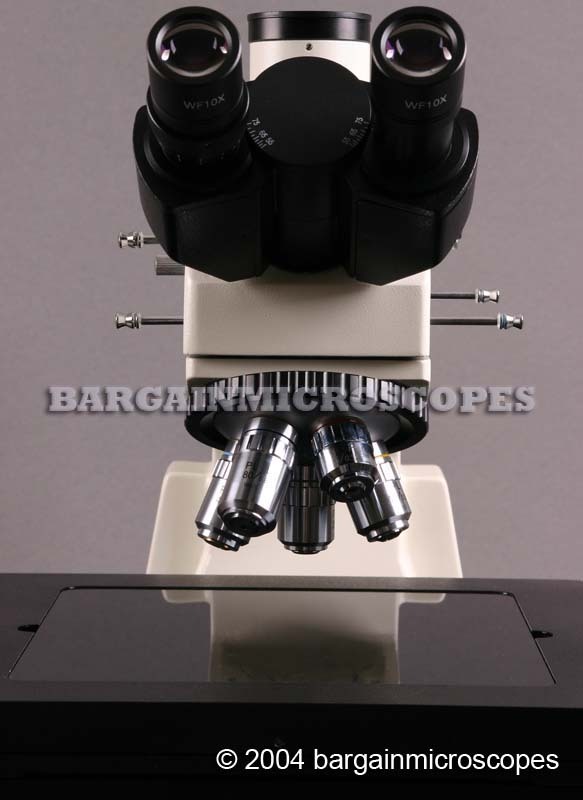 The Achromatic and Semi-Plan as Found on Other Scopes are the Cheaper Quality. Variable Intensity 20W Halogen Epi-Illumination in Internal Upper Rear Housing. Adjusts to the Distance Between your Eyes: 53 to 75mm InterPupillary Distance. Four Filters Included: Yellow, Blue, Green, Frosted. 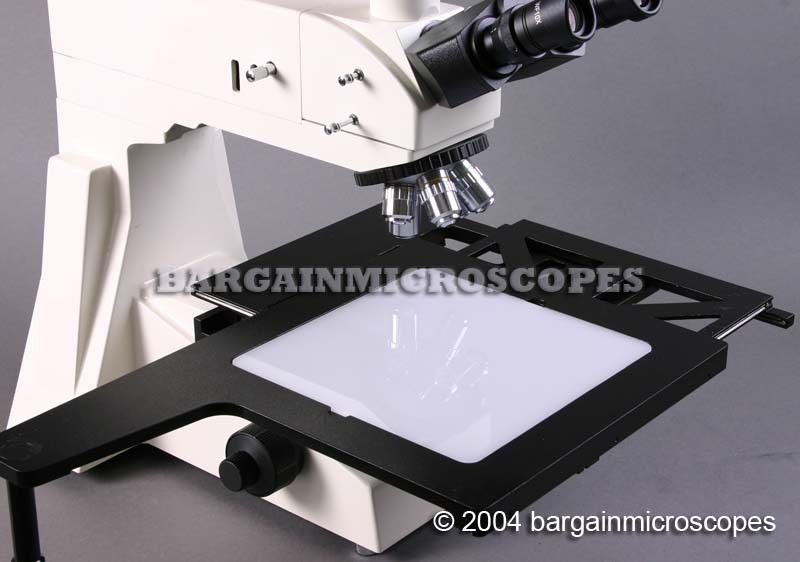 Includes Aperature and Field Diaphragms. Extra Large Mechanical X-Y-Z Movable Stage: Size 275mm x 275mm. Low Position Coaxial X-Y Stage Movement Knobs – Range of Movement: 84mm (X-Direction) x 60mm (Y-Direction). Extra Stage Movement is Accomplished by Moving the Top Sliding Stage Plate. 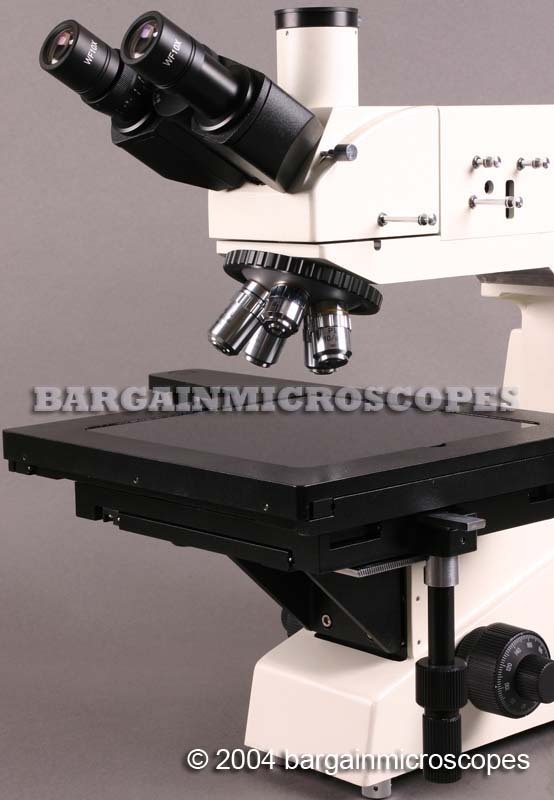 Control Arm on Left Side of Scope is Used to Move the Top Plate in X and Y directions. Simply Pull the Arm in the Desired Direction. This Movement is in Addition to Any Done by Using the Low Posion Coaxial X-Y Knobs. Maximum Distance From Bottom of Longest Objective to Top of Stage: 28mm. Coarse Adjustment Travel Range: 31mm (Stage Movement Distance Up/Down). Adjustable Lock Ring Stop to Limit Coarse Range to Protect Specimens. 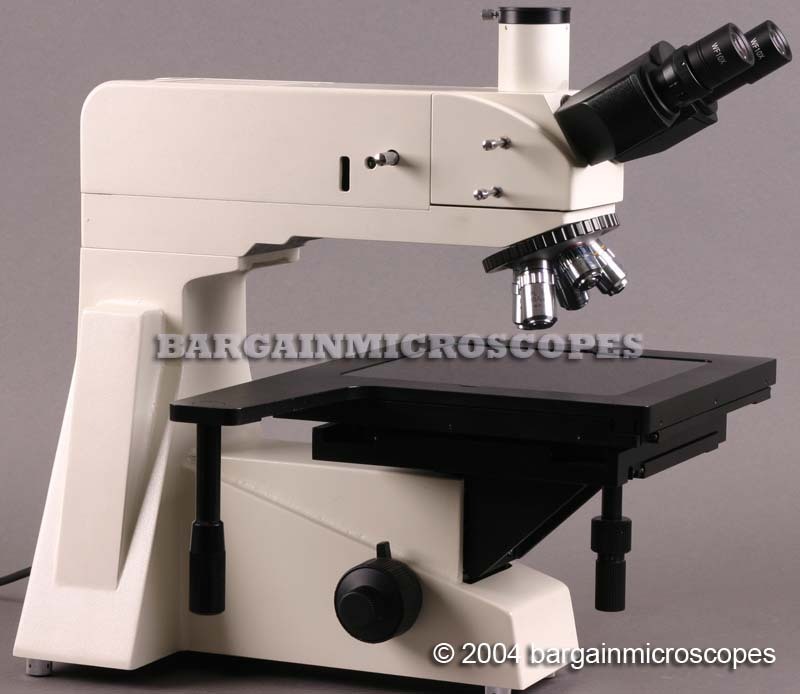 Total Overall Height of Microscope: 477mm. Includes: Dust Cover, Instruction Manual, and Extra Bulb. Includes One Black and One White Replaceable Square Stage Plate. Optional 100x Dry Objective. This objective does not use immersion oil.